צד אחד Effigy of Queen Elizabeth II and the words "Elizabeth II Niue Two Dollars 2016"
הפוך דמות צבעונית של Olaf עם אורות הצפוניות מאחוריו והמילים "Disney Frozen 1 oz 999 Fine Silver"
דמות צבעונית של Olaf עם אורות הצפוניות מאחוריו והמילים "Disney Frozen 1 oz 999 Fine Silver"
מטבע כסף Disney Frozen | Olaf שנת 2016 במצב Proof משקל אונקיה Add the latest silver proof coin featuring characters from the Disney's Frozen to your collection. This release is of Olaf, the enchanted snowman who was built by Anna and Elsa when they were younger. Olaf represents the love and joy Anna and Elsa shared together before being separated. The reverse of the coin features a colourized Olaf, with a highly detailed row of snow flakes separating the field and with shimmering northern lights behind him. Walt Disney attempted as far back as 1937 to adapt the Hans Christian Anderson fairy tale, The Snow Queen into an animated feature film. The film was finally released by Disney in 2013, and has become one of Disney's greatest successes. 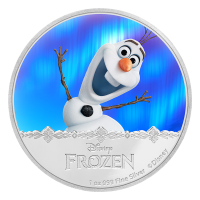 A stunning coin for Disney or Frozen fans, order yours today!